Art & Language including the Australian artist Ian Burn were at the forefront of International conceptual art practice in the 1960s, and remain active in the critical discussions around the reception of art today. One of the most interesting tendencies in modern art has been the emphasis placed on the process of reception of art objects rather than on their production. That is to say the phenomenology of the object carries more weight than authorship per se and at the same time the emphasis shifts from representation of objects to an evocation of their presence and perhaps the heightened awareness of the viewer of the act of looking. Conceptual artists pushed this further asking their reader/viewer to consider the mechanisms of representation rather than the thing being represented. Joseph Kosuth makes this very clear in his work 'One and Three Tables' 1965 from our collection. Here the table itself is presented, as it is, not as a representation, alongside it is a photograph of it taken in the site where it is showing and a dictionary definition of a table. 'Secret painting' makes playful reference to the history of monochrome painting. 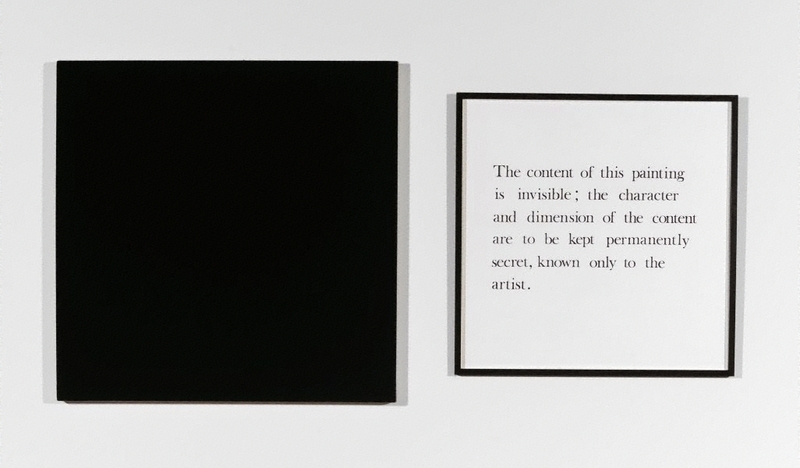 Malevich painting his 'Black square' in 1915 was simultaneously waving an avant-garde flag proclaiming the end of representational art and providing a space for meditation and for the projection of the viewers imagination into the void. Bob Law's 'Blue black indigo black' in our collection takes the form of a black square but within it the careful observer finds layers of blue and indigo that give the black field a sense of deep space in which you can lose yourself or find a hint of the black light of the Gnostics. Similar ideas inform the black square in Kounellis' major installation 'Untitled 1984/1987' also in our collection. Conceptual artists such as Burn made monochrome pictures as a more pragmatic critique of representation and a call to personal attention on behalf of the viewer. Burn's mirror work in the collection, 'No object implies the existence of any other' 1967 plays with these ideas while making the dogmatic assertion problematic by printing the words on a mirror that throws back the image of the viewer clearly contradicting the text. In the 'secret' paintings a Duchampian strategy has been used to activate the viewer's imagination. Duchamp once had a collector hide an object inside a ball of string that Duchamp sealed in a metal frame, no one would ever know what it might have been, not even Duchamp. The importance of shifting the artwork towards an experience of the act of perception on the part of the viewer can be dramatically demonstrated by a work by John Cage in 1952 entitled 4'.33''.This concert consisted of a pianist entering the hall sitting at the piano lifting the lid and then not striking a cord for 4 minutes and 33 second at which point he closed the lid of the piano and left. The audience necessarily became very aware of all ambient sound - a pin drop - the sound of a car in the street etc. The work became a frame for the world rather than a representation of it. 'Secret painting' like the Kosuth has three components a painting that we are led to believe exists, a text assuring us it exists and an overpainting that takes the form of a monochrome which might be considered either as a pure negation of what lies beneath or perhaps as an invitation for the viewer to let the imagination play. Signed and dated u.l. verso painting, black fibre-tipped pen "Mel Ramsden/ .../ 1967-8". Ian Burn, Art and Australia (Vol. 8, No. 2) , 'Conceptual Art as Art', pg.166-9, Sydney, Sep 1970, 169 (illus.). Lucy Lippard, Arts Magazine (vol. 47, no. 3) , 'Some of 1968', pg.45-47, New York, Jan 1973, 45. Michael Wardell, Contemporary: Art Gallery of New South Wales Contemporary Collection , 'Ideas and actions', pg.60-107, Sydney, 2006, 88, 89 (illus.). The third hand: collaboration in art from conceptualism to postmodernism , 'Conceptual Bureaucracy: Ian Burn, Mel Ramsden, and Art & Language', pg.25-56, Minneapolis, 2001, 41. Art conceptuel formes conceptuelles , 'Compendium introductif aux territoires conceptuels', pg.34-69, Paris, 1990, 49, 50 (illus. ), 51.
l'art conceptuel, une perspective , Paris, 1989, 105 (illus.). cat.no. 7, illustration is of 'Secret Painting' 1967-68, acrylic on canvas with photostat, canvas: 122 x 122cm, photostat: 91 x 122cm. Collection Bruno Bischofberger, Zürich. Kunst versteht keine Sau... , 'Welten im Kopf', pg.26-29, Stuttgart, 2012, 26-27 (colour illus.). Conceptual Art , 'Mel Ramsden', pg.204-5, New York, 1972, 204 (illus.). Conceptual Art , 'Art as idea', pg.28-53, London, 2002, 31 (colour illus.). fig.19, illustration is of 'Secret Painting' 1967-68, Liquitex on canvas with photostat, canvas: 122 x 122cm, photostat: 91 x 122cm. Collection Bruno Bischofberger, Zürich. New art in the 60s and 70s redefining reality , 'Medium as message/ message as medium', pg.70-111, London, 2001, 101 (illus. ).